The oldest Strudel recipes – a Millirahmstrudel and a turnip strudel – are from 1696, in a handwritten cookbook at the Vienna City Library. The pastry descends from similar Near Eastern pastries, which are not puff pastries, but closely associated with them. 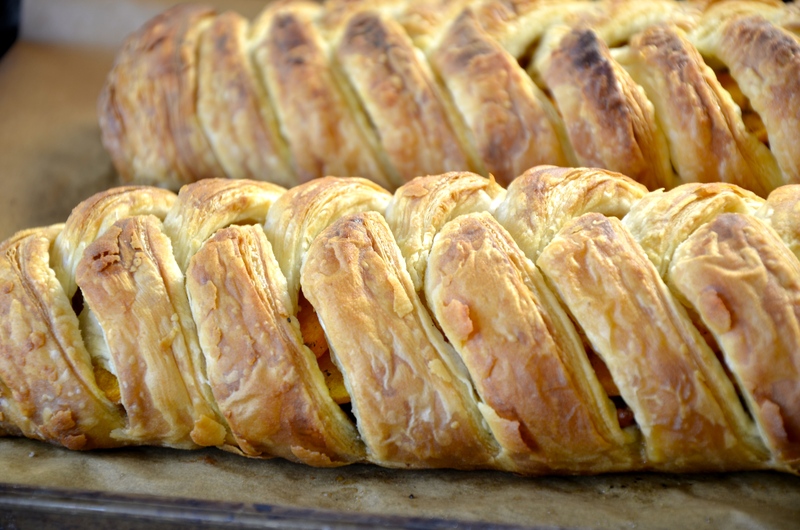 Lots of people these days use puff pastry, and move beyond the traditional fillings, both of which I’ve done in this recipe. Now, you might be thinking that there is no way puff pastry can be vegan, and you would be justified in having those thoughts. I’ve made puff pastry and it involved a crazy amount of butter. But did you know that most frozen puff pastries you buy at the grocery store are vegan? And they don’t take a whole day to make? And they are pretty tasty provided you put the right stuff inside. This one is both savoury and sweet, good-looking, relatively easy to make, and fabulous as a main attraction for Sunday dinner, lunch with a green salad, or even as an appetizer cut in thin slivers. Heat olive oil in a skillet over medium high heat. Add onions and cook until starting to get soft and translucent, about 15 minutes. Add brown sugar, pecans, and dried cranberries and continue to sauté until sugar caramelizes, another 5 minutes or so. Set aside. Brush butternut squash slices with a little olive oil and sprinkle with some salt and pepper. Grill for 5 or 10 minutes on your BBQ until soft, or bake in the oven for a few minutes until brown on the edges, but be careful not to burn them. Set aside. 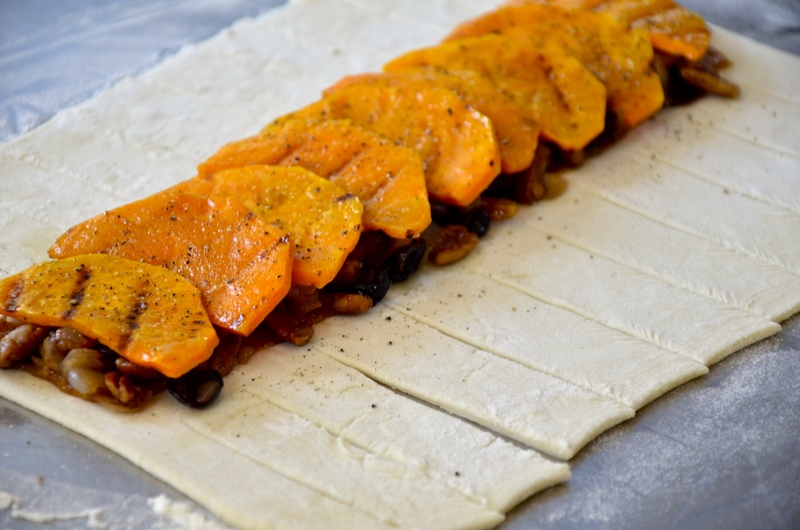 When ready, roll out puff pastry on a floured surface until you have a rectangle of 9″ x 12″. Spread mustard to cover the middle 1/3 of the pastry. Spoon onion mixture over the mustard. Place butternut squash slices on top of onion mixture. Sprinkle with sea salt and pepper to taste. Cut 1″ wide horizontal strips on either side of the filling. 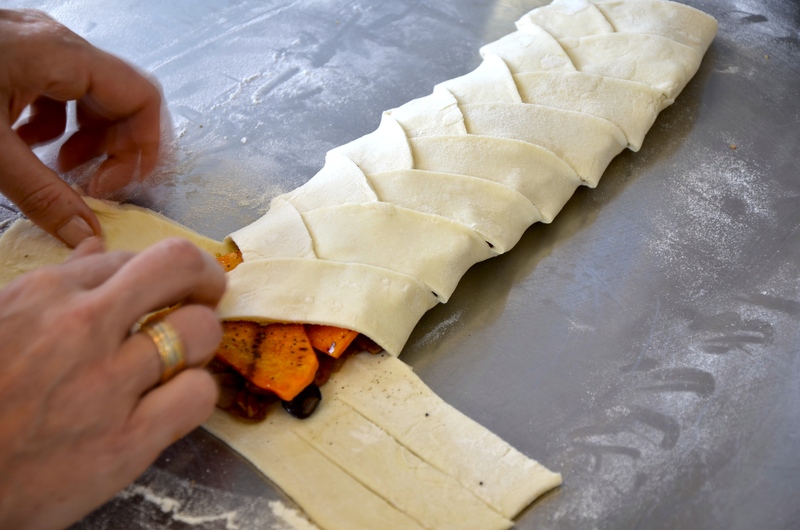 Fold strips on each side alternatively over the filling to create a braid. Brush with olive oil and sprinkle with a little fleur de del or some crushed dried thyme. Bake in the oven for 20 – 25 minutes until golden brown.